Soierie Vivante is the only association that exists, with the aim of safeguarding the silk heritage in Lyon. Soierie Vivante welcomes visitors in authentic workshops, holds demonstrations on protected looms, and preserves the heritage, the memories and the techniques. 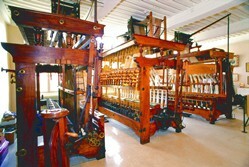 If you want to know everything about weaving and the Jacquard mechanism, visit our workshops! Soierie Vivante enables you to discover the very last remaining weaving workshops from the 19th century. The association organises guided visits without booking.